One of the things I love about working in the beauty and aesthetics industry (3 of my agency’s clients are medical spas) is getting to learn about the latest and greatest beauty treatments and seeing people leave the spas just glowing. I have tried to make a little at home pampering a priority on a weekly (or every other week!) basis and I put together a routine of my favorite Colleen Rothschild products (ALL 25% off RIGHT NOW with the code FAMILY25) to create the perfect at home facial. 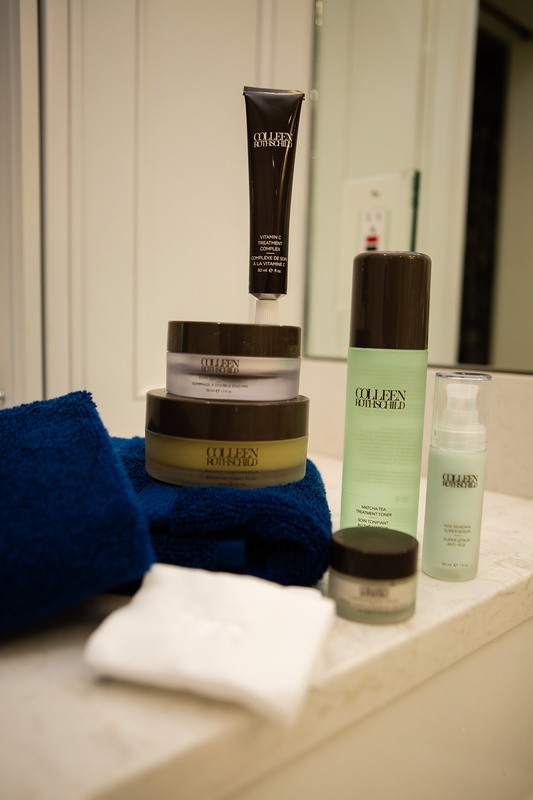 After you do this facial, your skin will feel glowing, soft and smooth. And if you do this at night before bed, you’ll sleep SO well too! I try to make this complete time to myself. So I’ll wait till the boys go to bed so I can take a shower, get in my PJs and just hang out while my mask sits. I also love making a bit of a spa space out of my bathroom with the fragrance from my Colleen Rothschild candles. The Roisin is my absolute favorite and really smells like a room full of fresh roses – it’s light, feminine and beautiful. You will LOVE it! Step 1: Cleanse // Colleen Rothchild’s Radiant Cleansing Balm is one of my all-time favorite products from the brand. 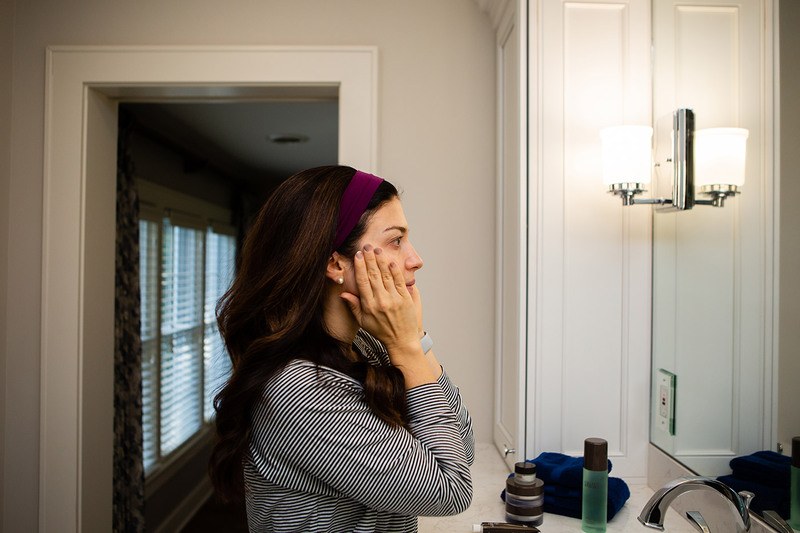 It is great for taking off your makeup and gently cleansing your skin without feeling dry and stretchy afterward. When you get a little scoop out of the container, it is thick so you warm it between your hands and then massage over your face. I like to sort of sweep my hands in an upward and outward motion for a few minutes. Then you take a muslin cloth damp with warm water and hold it over your face for a few seconds before wiping off the balm. Then do a splash of cold water and towel dry for the next step. Step 2: Tone + Mask // I love a toning step in a skincare routine, it just is great for refreshing your skin. The brand new Matcha Tea Treatment Toner is great for detoxifying your skin. You put just a bit on a cotton pad (they also have these super soft cotton pads) and sweep it all over your face and neck. I also do this behind my ears! If my skin is feeling kind of “heavy” and congested (I get clogged pores on my chin and that’s how I can really tell this feeling!) I will choose the Clarifying Detox Mask. 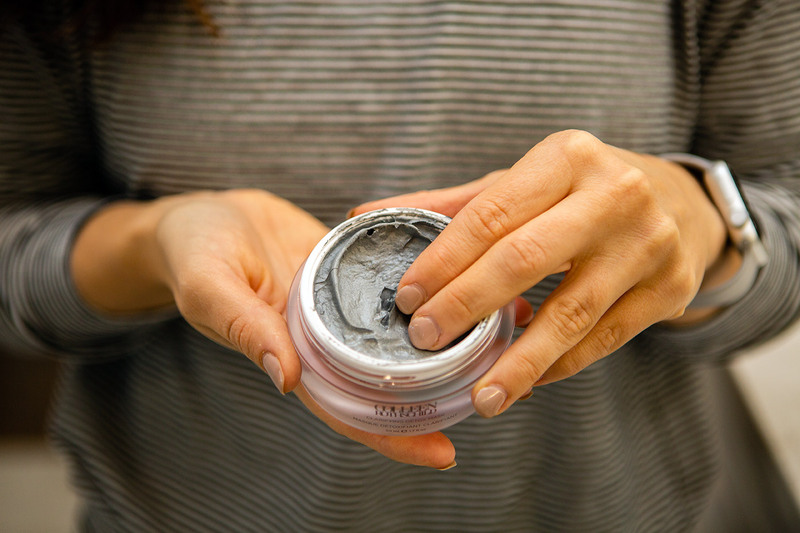 It’s a charcoal and clay mask that really is great for detoxing pores and balancing out your skin. It dries on a bit so you get that feeling it’s pulling out the grossness (highly technical term) from your skin. You leave it on for 10 minutes and then use wet hands to splash and remove from your skin before towel drying and moving on to the next step. 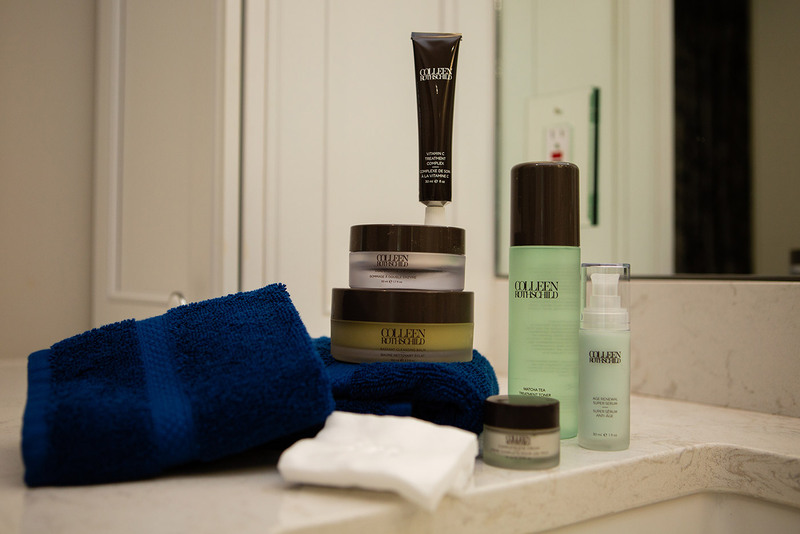 If my skin is feeling more dry to normal, I like to do some exfoliating with the Dual Enzyme Polish. It’s a very gentle exfoliator and is great to balance your skin and add some glow. You apply it as a mask and leave it on for 5-10 minutes before scrubbing into your skin and splashing off. Step 3: Serums + Treatment // Facials are not only to help you relax but they’re also typically targeted and crafted to help your skin. So you can do that at home, as well by using serums and treatments. 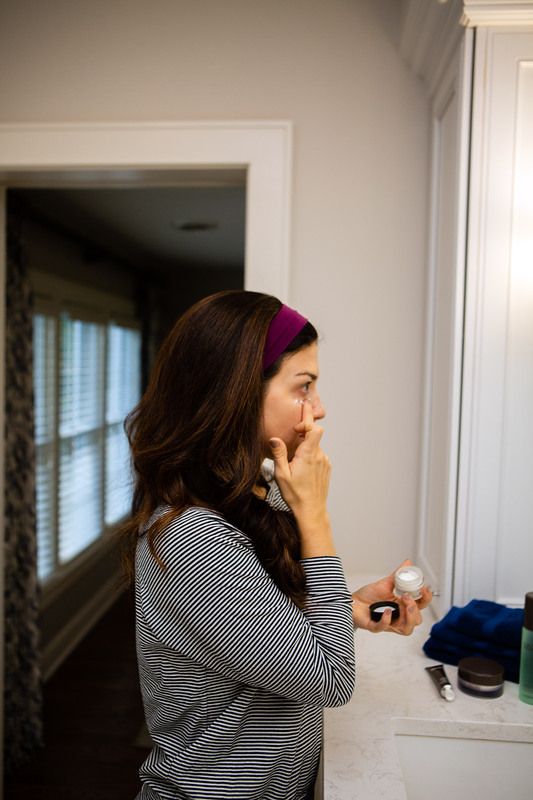 Age Renewal Super Serum // I start with this one because it is a fantastic all-purpose serum that works on improving texture, tone, radiance, lines and elasticity. You do a pump of this and press into your skin, all over your face (not your eye area). Treatment Complex // Again, I alternate between two products here: the Retinol Treatment Complex and Vitamin C Treatment Complex. Vitamin C is great for brightening your skin and targeting hyper pigmentation. Retinol is the anti-aging wonder and helps with cell turnover and overall improving the appearance of your skin. So how do I choose? I typically don’t use my retinol every day, so if I’ve just used it, I will do the Vitamin C. If it is already supposed to be a retinol night, I’ll use the Retinol Complex. Step 4: Moisturize // The last step is all about moisturizing and setting everything in. I use the Complete Eye Cream and gently tap it in all around my eye area. It’s nice and rich and moisturizing and soothing. Then I will end with the Extreme Recovery Cream. It’s another rich moisturizer that is really great for soothing and hydrating your skin. You don’t need much of it at all, and it’ll also be a great every night winter moisturizer if you’re looking for one like that. Bonus Steps // I’ll end with the Ultimate Lip Balm for hydrating (and it has a bit of plumping power to it!). Then finally I do the Restorative Hand Cream with a couple of drops of Face Oil mixed in – this is a great combination for your hands at night, and it really helps heal your hands in the dry winter weather ahead! All of these products in today’s post are 25% off now through October 21 with the code FAMILY25 so it’s the perfect time to try something and create your own at home facial! I also highly recommend the Discovery Kit if you want to try some of these products or are traveling and need skincare to take with you!